A new way of buying food is coming to Clapham Common. As seen in the BBC and The Guardian, The Food Assembly is a local initiative that brings people together to buy fresh food directly from local farmers and foodmakers. Every week Food Assembly customers in Clapham can order food online from local food producers before picking it up weekly at a local venue. All the food comes from an average distance of 28 miles, compared to the 600 miles with a supermarket. Community is at the heart of The Food Assembly – it connects neighbours to farmers, neighbours to each other, and everyone to their food. 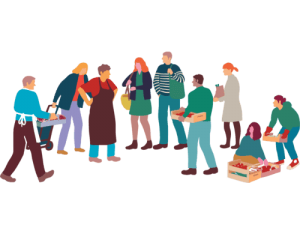 By choosing to buy local, shoppers can support the community of Clapham, as for every £1 spent through Clapham Common Food Assembly, 90p stays in the local economy. It also ensures your money reaches the right people; food producers keep over 80% of sales for every product sold, compared to 15%-25% through supermarkets. Also, there is less food waste as all the food is ordered in advance. Whether from their iPhone app or laptop, weekly shoppers can choose from unique local products, such as artisan bread from The Hill Bakery; cured meats from London Smoke and Cure; and yummy jams from Single Variety Co. Not to forget plenty of fresh local vegetables and cheeses. The Clapham Assembly is organised by local residents Alex, Mathieu, Thea and Loren who love to share their passion for food with others.